If you’ve not heard of A Game of Thrones by now then it’s a pretty good bet that you’ve been living under a massive, sound-proofed rock for the last six months, probably somewhere high in the Chillean Andes or something. The HBO series - which was aired earlier this year - proved hugely successful and catapulted the already popular series of books on which it was based, further into the limelight. It also introduced the names Baratheon, Stark and Lannister to a whole new audience. Unfortunately, the series was only ten episodes in length and the next season isn’t due to air until April of next year, which leaves a painfully long Thrones-free zone to fill, especially if you’ve already read up to and including a Dance with Dragons. Never fear though as bit-gamer is here to help - we’ve been spending the last few weeks playing A Game of Thrones: The Card Game to see if it’s a worthy way to while away the approaching winter. Play as House Lannister, Stark, Baratheon or Targaryen. Anyone who has dabbled with Magic: The Gathering will be pretty familiar with the initial setup of A Game of Thrones as each of the 2-4 players has a deck of cards on which they can call. This deck can be adjusted and boosted via the purchases from the myriad of expansion packs and booster sets available for the game. For the purposes of this review, we’ll just concentrate on the four starting decks that come with the core game, each of which relates to one of the four family houses from the book - Stark, Baratheon, Targaryen and Lannister. Each deck is built up of character, location, attachment and event cards, with each player also having a small, separate plot deck. There is a pleasing amount of variation between the four core decks, with each having its own distinctive flavour. The Stark deck, for example, is short on the kind of money-making locations that the Lannister and Baratheon decks can call on but makes up for this with an overabundance of powerful characters and attachments. Choose a role to play each turn, to give you powers or protect you against enemies. 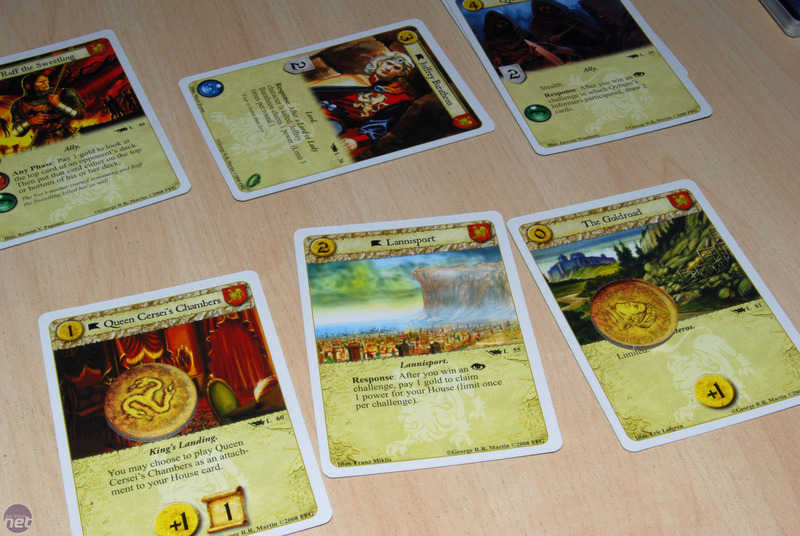 The game is played around a central board which plays home to the six titles that the players choose from each turn. These confer various abilities and stats boosts which become increasingly invaluable as the game progresses and can provide a hint as to what an opponent’s plans are. The six titles also interact, with some opposing or supporting each other. This makes for potentially interesting politicking and backstabbing when you get towards the latter stages of the game, especially if you’re playing with someone like Joe who has the moral integrity of a wet sponge. The aim of the game is to accrue 15 influence - a resource that can be won or lost through influence challenges, by attacking an opposing title or by having the most gold left at the end of a round. Everyone knows how much influence everyone else has got at any given time, so it can be challenging to actually win a game as anyone approaching 15 influence immediately becomes a big flashing target for the other three players. As a result, most of the games that we played were usually won by a ridiculously elaborate, multi-card gambit which the winning player had been lining up for a number of turns. 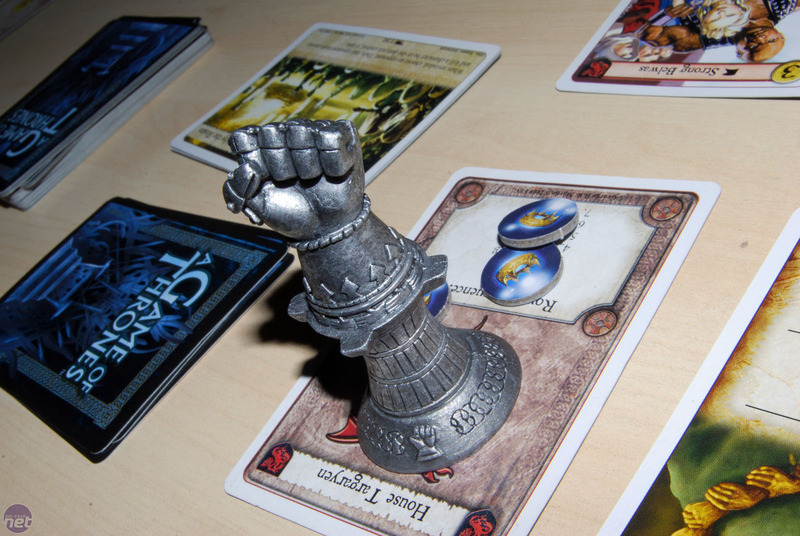 A board game based on the Crysis series is being produced in Germany.